As of the 6th of May 2018, Gregory Hunter has been appointed to role of National Business Development Director of the NSSA. The role was created by the NSSA board as a means to further develop and create corporate, educational and public partnerships on behalf of the NSSA. 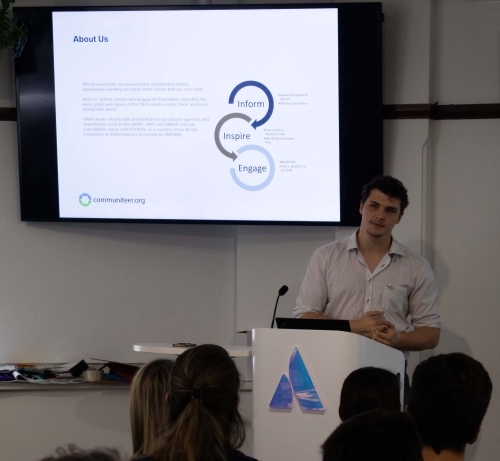 Gregory although still a student at Macquarie, has successfully held a number of executive and business development roles within a number of organisations. A large majority of which are seen to be held within varying branches of the United Nations. As for where his passion for space comes from, he would accredit that to his hands-on experience within organisations such as CSIRO and Microsoft, where he was given a taste of what life is like working on cutting edge technology. To further this, he is also currently working with NSS Chairman Kirby Ikin on the development of the United Nations Space Development Summit (UNSDS) which will occur this November in Sydney. His first task in this role is assisting with developing the Industry sessions of the coming Australian Space Research Conference in September 2018.